Every work has deadlines. Companies that often have tight and stressful deadlines like to ask their applicants how they handle pressure. This is an easy question to answer even if it makes you nervous. This question is asked in a way that it requires a “yes or no” answer, but don’t just say “yes.” Working well under pressure is a good strength/trait to have. But saying yes is not enough; you need to explain how you can handle pressure situation to bring the best out of it. Your words and actions throughout the interview itself may tell them what they need to know, but you still need to prove it by your words. Be sure to convey your ability to work calmly and efficiently whilst achieving results. - Don't answer this question in just YES or NO format. 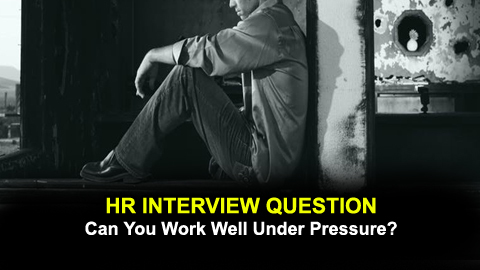 - Highlight your answer with examples that strongly shows your ability to work under pressure. - Try to focus on situations in which you were under pressure, but remember this must be work related not your personal stress or pressure. Answer 1: I believe I work the same if there’s pressure or not. I try and take the emotional factors and work hard regardless of downtime. I always prioritize and organize my work and hence that gives me a Psychological advantage overpressure. At times whenever time becomes a constraint I put extra effort and time to meet the deadline. So pressure has nothing to do with my work.